The theme this year resonated with national healthcare systems in Europe, which are continuously changing, reorganising and adapting to respond to changing demographics and budget restrictions. Technology continues to influence wound care clinicians in their practice, although likely to a lesser extent than other medical disciplines. These advancements should translate into improved cost savings improving patients’ quality of life. A series of presentations under the Wound Care Diagnostics theme highlighted how the MolecuLight i:X is influencing wound care on many levels: improving debridement and sampling techniques, impacting antimicrobial stewardship programs and guiding patient care, education and adherence. A record breaking nine abstracts featuring the MolecuLight i:X were accepted this year in ePoster and oral presentations. 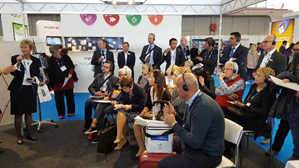 This year’s EWMA meeting in Amsterdam was a great success, attracting approximately 3700 attendees and over 150 exhibitors. The meeting kicked off with the exciting announcement of Smith & Nephew’s exclusive, worldwide distribution agreement for the MolecuLight i:X, resulting in much buzz at the conference and heavy traffic to the MolecuLight Inc. booth. Nine abstracts featuring the MolecuLight i:X were accepted for presentation at this year’s meeting, highlighting the innovative work of clinicians from across Canada, Germany, and the United Kingdom. 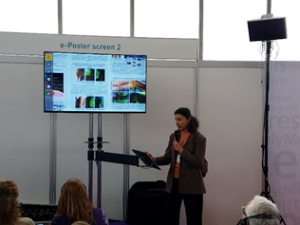 In her four presentations at EWMA, Rose Raizman (Scarborough & Rouge Hospital, Canada) highlighted the clinical benefits of bacterial fluorescence on guiding treatment selection and timing of dressing changes in negative pressure wound therapy patients, targeting debridement to regions of bioburden in diabetic foot ulcers, and guiding cleaning and patient education in obese wound care patients and in pilonidal sinus wound care patients. Dr. Heinrich Rotering (Muenster, Germany) presented his novel work using MolecuLight i:X to visualize bacteria in infected pacemaker leads, guiding immediate intraoperative treatment, while Dr. Steve Jeffery (Manchester, UK) summarized his recently published trial on the use of MolecuLight i:X to help manage bacterial load in burn patients. Dr. David Russell (Leeds NHS Foundation Trust, UK) presented on detection of bacterial fluorescence in a deteriorating, asymptomatic diabetic foot ulcer, while MolecuLight Inc. clinical trials manager, Monique Rennie, PhD, presented the final results of their most recent clinical trial, which determined that the positive predictive value of red fluorescence on MolecuLight i:X images for detecting bacteria is 100%. An oral presentation by Rosemary Hill (Vancouver Coastal Health, Canada) highlighted her work using the MolecuLight i:X to guide antimicrobial stewardship practices, an urgent issue of global concern. 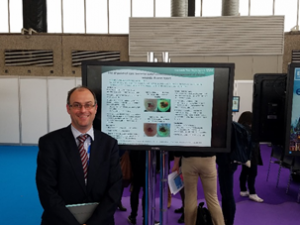 Many clinicians also presented their work at sessions hosted in the MolecuLight Inc. booth. These in-booth sessions attracted a mass of clinicians eager to learn more about the clinical uses of this novel device, resulting in standing room only crowds. MolecuLight Inc. founder and Chief Scientific Officer, Dr. Ralph DaCosta, summarized MolecuLight i:X clinical evidence to date before compelling presentations by Dr. Stephan Landis (Guelph General Hospital, Canada) on fluorescence guided debridement, Rose Raizman, Rosemary Hill, and Dr. Steven Jeffery. The MolecuLight i:X Imaging Device is approved by Health Canada (Medical License #95784) and has CE marking (Certificate #G1160292355002) for sale in the European Union. US FDA De Novo approval pending – the MolecuLight i:X Imaging Device is not available in the US. The EWMA daily newspaper featured on the 2nd day of the conference (May 4th) an article about the new joint partnership between MolecuLight Inc. and Smith & Nephew.